Did you know that each year more than 12,000 children and teenagers are diagnosed with cancer? Did you also know that one in every 330 Americans develops cancer before the age of 20? If you'd like to learn more about how your Club can make a difference, visit the Optimist International website at www.optimist.org/ccc. 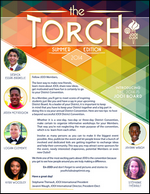 Please contact the Programs Department at ccc@optimist.org or (800) 500-8130 if you have questions. Our District website also has a wealth of resources for Childhood Cancer Campaign. Here is President Danny's address from the Bloomington, MN Parallel District Conference. Find out for yourself what eOptimist.org is all about during "March madness" and share the Optimism with your friends and family! During March, new members' fees will be waived when they enter the discount code "MARCHMADNESS" on the join page. 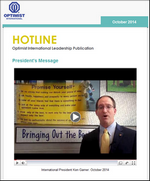 If you’ve been to the Optimist website today, you may have noticed that it looks a little different. The website is sporting some new colors as well as a few additions to the main pages. The home page of the website now has news items that will be updated regularly. The main Members page has links to some of the more popular pages to make navigating the website easier. The main Visitors page features a series of Optimists talking about what Optimism means to them. Expect to see more Optimists featured in the near future! Optimists familiar with the website will find that, aside from these first few pages, navigation remains the same as in the past. 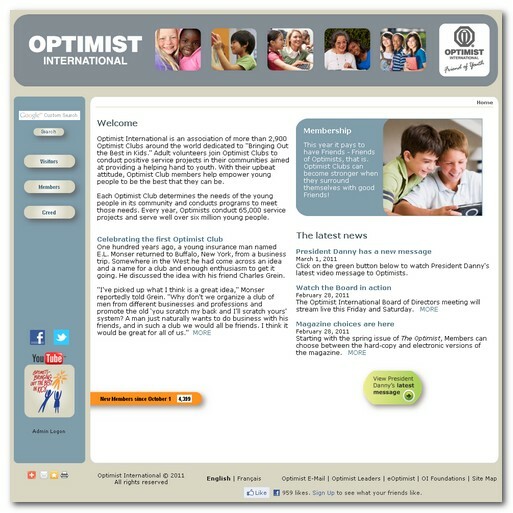 Visit www.optimist.org to check it out. The Optimists in the Maryland/South Delaware District are looking forward to seeing all of you and the members in your Districts at the 2011 OI Convention in Baltimore, Maryland, on July 3, 4, & 5, 2011, at the Baltimore Marriott Waterfront Hotel on the Inner Harbor in Downtown Baltimore. 1. What is there to do in Baltimore? The best way to find out is to go to www.baltimore.org and check out everything the city has to offer. 2. What is the closest airport to the convention hotel? Baltimore Washington International (BWI). Check out the airport's web site at www.bwiairport.com. It's a short shuttle ride (15-20 minutes) from the airport to the hotel. 3. We're coming by train. What is the closest train station to the convention hotel? Penn Station in Baltimore. It's just a 10 minute cab ride from the hotel. See the notes on the OI web site about discounts that Amtrak is offering. 4. We're thinking about bringing our kids and/or our grandchildren to the convention. Will there be anything for them to do? You can register them to participate in the youth program. On Sunday afternoon they be going out on the harbor with the Urban Pirates; Sunday evening they'll have dinner and then participate in games, crafts, and a magic show; Monday--they'll visit the Maryland Science Center and the National Aquarium at Baltimore and in the evening they'll have dinner, participate in group activities and watch the July 4 Fireworks on the Harbor; and on Tuesday they'll spend the day at the Baltimore Zoo. It will definitely a fun time for them. 5. Will we be able to go to a baseball game like we did in Denver? The Baltimore Orioles will be out of town during the Convention, but they are playing the St. Louis Cardinals on Thursday evening, June 30, 2011. We will have tickets for that game beginning in January. Yes, that June 30 is early, but you can arrive on Thursday, go to the game on Thursday evening and then do some sightseeing in the Baltimore area on Friday and Saturday before the convention begins on Sunday. b. Serve as a hostess/hostess at the Appreciation Luncheon on Monday. You must purchase a ticket for the luncheon in order to do this. It's fun and we'll show you what to do. c. Volunteer to be a chaperon at some of the youth activities. Chaperons must be over 18 and be an OI member or spouse of a member. 7. Does the Host Area Committee need an financial assistance? Yes, additional funds are welcome. We do have an opportunity for both individuals and/or clubs to make a donation to support the Host Area Committee. All individuals who make a donation of $25 (US) or more will receive a certificate and all Clubs that make a donation of $50 (US) or more will receive a Host Area Committee Sponsor banner patch. Names of all sponsors will be listed in the OI Convention Program. See flyer for more information. We hope you find this information helpful. Please feel free to share it with clubs and members in your Districts. If you have questions and/or would like additional information about Baltimore and the surrounding area, "Just Ask!" and we'll be happy to assist you. Ronda Vaughn, OI Director of Meeting Services, and Sharon Parton, OI Meetings and Travel manager, will be happy to assist you with specific Convention questions. You can contact them at 800-500-8130. Have a GRREEAATT and Optimistic Holiday Season and New Year! We'll see you in Baltimore!